How to remove interlacing artifacts from a video using AVS Video Editor? It might happen that while watching a video recorded a DV camera or the analog input of a video card on your computer monitor, it appears to contain so called "interlacing artifacts". Actually that is a series of horizontal lines. This effect occurs when a video recorded for showing on a television screen is watched on a computer monitor. The difference between them lies in the way they deal with video. On the computer monitor the whole frames that make up a video are shown, whereas the television screen displays video as half-frames, called fields. Each frame contains two fields - odd and even horizontal lines. The computer monitor updates the image only once for each frame of the video, thus showing both fields that make up a video frame simultaneously. But the television updates each field of a video frame separately, that's why it must update its display twice to show a complete frame. So watching an interlaced video on the computer monitor we can see these artifacts, because each field represents a different moment in time and the monitor updates first only one field and then the other. You can easily solve this problem applying the Deinterlace effect offered in the AVS Video Editor program. Please read the How to start working with AVS Video Editor? guide to learn how to download and install the application, import your video and add it to the timeline. After the video you want to edit is put on the timeline, please follow the steps below to apply the Deinterlace effect thus fixing your video. To remove interlacing artifacts from your video and watch it on your computer monitor without distortions, use the Deinterlace effect. To find this effect, press the Video Effects central button within the main window of AVS Video Editor. Then all of the available effects will be displayed within the Files and Effects Area. 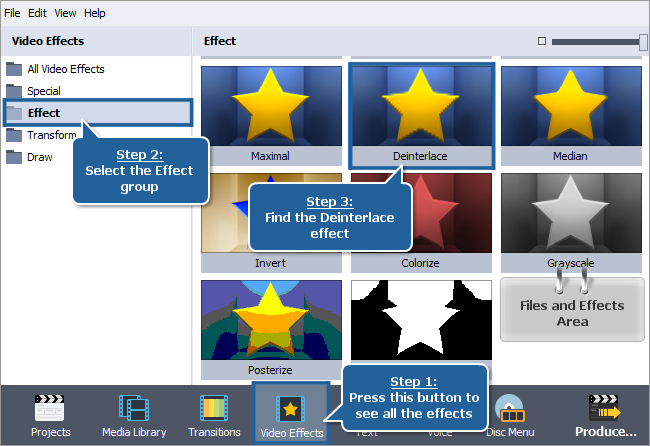 To find the necessary video effect more easily, you can select the Effect group from the effects groups displayed on the left. As soon as you find the Deinterlace effect in the Files and Effects Area, you will need to add it to the timeline situated in the lower part of the program window. To do it right-click the Deinterlace effect and choose the only available option of the express menu - Add or Replace Video Effect. After doing this the effect will be displayed on the timeline. You should enter the value into this field that corresponds to the total file duration. 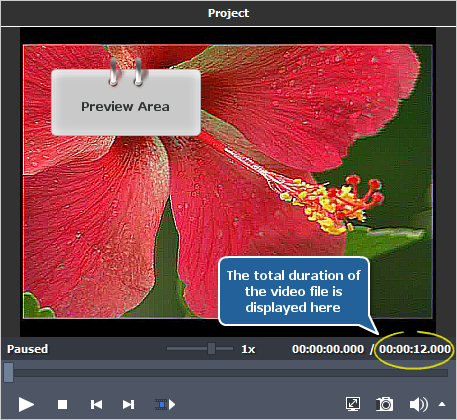 To learn the exact duration of the file you are editing, look at the Preview Area situated on the right-hand side. Here you can see the total duration of the video file, as well as the current cursor position. To apply the video effect to the entire file, set this value within the Duration window. Then the effect will occupy the whole video effects line. 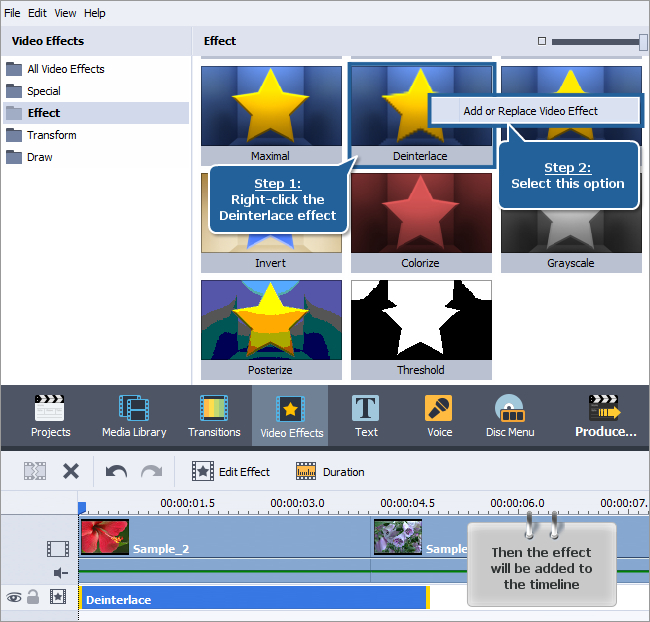 Click the Edit Effect button above the timeline to open the Video Effects window. After the window pops up, you will see the Even and Interpolate boxes that are checked by default. These are the recommended effect settings. So the interlaced video will be fixed by removing even field of the video and blending (interpolating) the remaining lines. As soon as everything is done in order to fix your interlaced video, you can preview the file with the applied effect to make sure you got the necessary result. 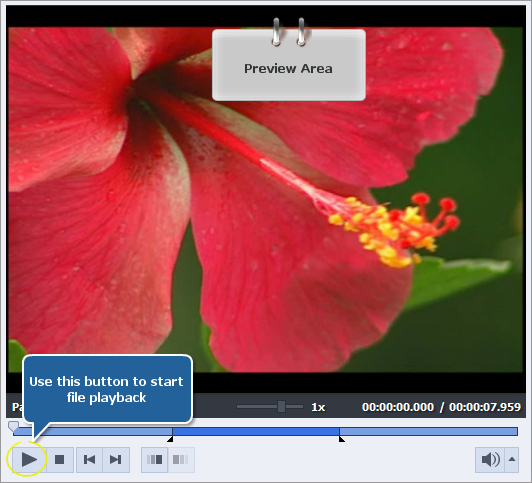 Please, press the button within the Preview Area of the same window to start playback. If you are completely satisfied with the result, click the OK button to accept all the changes and close the Video Effects window. 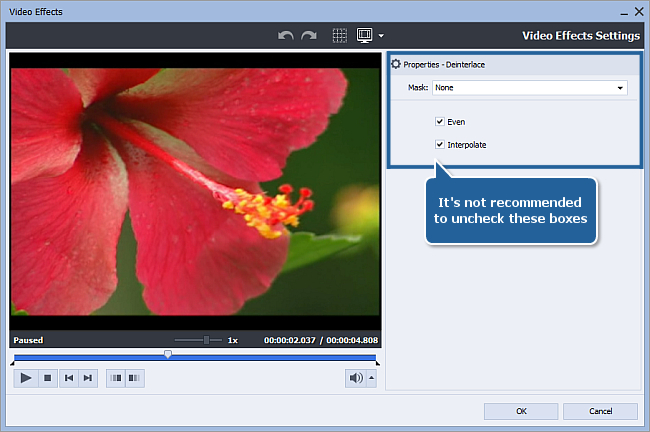 Then you can save the current project, as well as the edited video file into one of the supported formats. To learn more about it, read the How to save the project and the video in AVS Video Editor? guide.